Jasper was born in Enschede, Holland on June 30, 1947. The child of a jazz trumpeter and a classically trained singer and pianist, his great interest in music became evident at an early age. At fourteen he wrote his first compositions and became increasingly interested in jazz. His parents would have liked to send him to a conservatory, but he preferred to play live. At nineteen Jasper was already participating in various jazz festivals and raking in prizes. Before forming Pili Pili, Jasper was part of several acclaimed bands, solo projects and collaborations. His first ensemble, ‘Association P.C.’, was found in 1969 and reached European success by combining jazz and rock. ‘Pork Pie’ came to life in 1973 and similarly merged the technical-artistic virtuosity of jazz with the dynamic extroversion of rock. The year of 1976 marks the debut of Van’t Hof’s solo career with the album “The Self Kicker” followed by “Axioma” almost twenty years later. In this period he collaborates with Archie Shepp, Manfred Schoof, Wolfgang Dauner, Zbigniew Seifert, Toto Blanke, Stu Martin, Alphonse Mouzon and Bob Malach. As a result of these musical search, Jasper Van’t Hof has made more than seventy records up to this date. His work received the ‘Bird Award’– the highest distinction for jazz musicians in Holland– in 1997. In 2005, Jasper gathers a new band project including three horns, bass and drums. The ensemble becomes HotLips. With HotLips Jasper managed to provide a convincing mix of varied and inspired compositions, attractive tunes, improvisations, sonic surprises, and European chamber jazz. As a testimony, their debut album and a live performance CD is offered by JARO Medien. For more information on Jasper please refer to: www.jaspervanthof.nl. Jasper van’t Hof’s arrangements are informed by all the variation and wealth of his musical career. They combine the jazz idiom with minimalist repetitions, harmonious loops reminiscent of Erik Satie and the decidedly Baroque figures he formulated for the brass section. All the while, he plays fusion on the keyboard with supreme mastery, now permeating it with the rhythmic force of funk rock, now feeding it with the metric diversity of his ethno-jazz experience, always offering his musicians plenty of scope for explosive improvisational excursions. Question: In your biography, ASSOCIATION P.C. is referred to as your first band, but wasn’t there a kind of predecessor by the name of BARBAROSSA? JASPER: There may have been a few concerts with Toto Blanke and Sigi Busch where we used that name. I remember the name didn’t go over very well in Holland; nobody knew what to do with it. But I also remember that it was under consideration; it’s possible we even performed as BARBAROSSA. Then Pierre Courbois joined us and we called ourselves ASSOCIATION P.C. What were you playing back then? An acoustic piano or was it already an e-piano? JASPER: I had a Hohner Pianette, an absolutely wonderful instrument; I wish I had one today. But I was also still playing an acoustic piano. In those days the pianos in the jazz clubs were extremely poor. So it was a huge relief for both the band and the producer that there was finally a band that brought along its own piano. It was a board with four octaves, twenty cm deep and a few cm thick – that was my piano! Then, in late 1968, “Lifetime” was released with Tony Williams, John McLoughlin and Larry Young on the organ; instead of an organ I bought myself a Fender. And it gradually became obvious that Miles Davis’s drummer was pursuing the same concept we had already been working on with ASSOCIATION for a year. And then there were the Berlin Jazztage of 1971, which already carried a lot of weight internationally. Tony Williams’s “Lifetime” and ASSOCIATION P.C. appeared on the same stage, one after the other, the same night. The press said: You can forget about Lifetime; ASSOCIATION P.C. with Toto Blanke – that’s where it’s at! The band toured until 1975 with quite some success. We made it all the way to Indonesia. Is it true that PORK PIE got underway during the same period? JASPER: Well, more or less. In about 1973 I came into contact with Philip Catherine; through him I met Jean-Luc Ponty, who introduced me in turn to Aldo Romano. I did a number of concerts with Jean-Luc. At about the same time, ASSOCIATION and I decided there had to be a change; I wanted to leave the band. It was extremely difficult for me to leave a band I had co-founded and worked on developing for years. But a lot was happening with Jean-Luc, and the work with the bassist Peter Trunk was almost even more important. We started a band together in Munich, a fantastic band: Manfred Schoof was with us, Joe Nay and Sigi Schwab; on one tour Udo Lindenberg was the drummer. We played together for about two years, frequently performing as the Peter Trunk Quintet or Sextet, so inevitably I spent a lot of time in Munich. It was around then that I met Charlie Mariano who was also living in Munich. I also stayed in touch with Philip Catherine, who lived in Brussels. …though it should be added that Philip Catherine was still an unknown quantity in the European jazz scene. JASPER: Yes, that’s true. Philip was still relatively unknown. He was still working with the organist Lou Bennett or had just left Bennett’s band; I’m not sure. We became closer and then I introduced him to Charlie Mariano; there was also a phase with Stu Martin. In any case, we were playing together in Paris at the time: Philip, Aldo, Henri Texier, Charlie Mariano… That went on for about half a year and it was unbelievable, the pieces that evolved, the solos we played, just unbelievable: Charlie had just returned from India and brought influences with him from there, and me with my “electronics.” In the end Jean Francois Jenny-Clarke joined us because we wanted a double bass. It was a fantastic band. Was it also a band you could classify as Fusion? JASPER: I’d put it differently: During the European free jazz period it was the first European band to go back on the stage and play a melody – a European melody, not bebop, not the typical American lines. But I also have to point out that Charlie Mariano was undergoing a kind of European metamorphosis at the time, which probably never would have happened if he had stayed in the U.S. In the 1970s there was also something else going on: I came into contact with MPS leading me to Alphonse Mouzon and in turn to Bob Malach. The encounter with Bob was decisive. The inventor of the Adolphe sax must have thought to himself: The way Bob Malach plays this instrument is how it’s supposed to sound. That was the wonderful beginning of a duo partnership that has lasted until the present. Do you two still have something to say to each other? JASPER: Sure we do. Of course, we’re like two wax figures from Madame Tussaud’s but we don’t care; what we care about is music. For example, because of the way we think, we don’t have any record company hovering over us; we don’t have a single obligation, no pressure to sell a certain number of CDs. If someone wants to listen to our duo music: fine! If they don’t want to listen to it: also fine! Of course it’s ridiculous to talk about such a wonderful concept that way. Is it also part of the concept to say: What we are, first and foremost, is a live duo? JASPER: Yes. And another one of our principles is: No microphones! This is acoustics, this is chamber music. And what’s more, we don’t have to bow down to any expectations: We play what we want to play. In this connection I’d like to tell a story about why Bob Malach and I insist so strongly on remaining independent: I get a call about recording an album and I invite the Polish violinist Zbigniew Seifert, John Lee (bass) and Gerry Brown (percussion); the album is called “Eyeball” after one of the tracks. Five hundred get sold, and that’s it. Two years later I hook up with Didier Lockwood (violin), Bob Malach, Aldo Romano and Bo Stief. We make an album and, in honour of Zbigniew Seifert, who had died in the meantime, I call the band EYEBALL. Then suddenly the guy who hadn’t been able to sell the first record and had put it on the back shelf notices that there’s a band called EYEBALL with different musicians and has the record produced again under the band name “Eyeball.” And suddenly there are two LPs and supposedly two bands, one with a dead violinist, one with a living violinist. That was very, very embarrassing and for me it was the first conflict I ever had with a record company, and the only one to date. But to return to the musical biography, there’s not a whole lot more to tell: With EYEBALL we’re already in the ’80s, then came PILI PILI, and there were duets with Bob Malach all along. I also played in a duo with David Friedman and in a trio with Kenny Wheeler. Roughly, that’s about it. I made some recordings playing on an Italian church organ. And now of course I have just recorded my first solo CD in a long time, playing on a concert grand in a room with outstanding acoustics. Your solo albums are few and far between. What appeals to you about playing solo? JASPER: Above all the dynamics. It’s absolutely direct. I can play softly one minute, very loud the next minute and the whole time very directly, almost like in nature: less air in the trombone, more air in the trombone, that’s decisive. You write different melodies because of the dynamics, you improvise differently because of the dynamics; you exploit the drama in your solo. 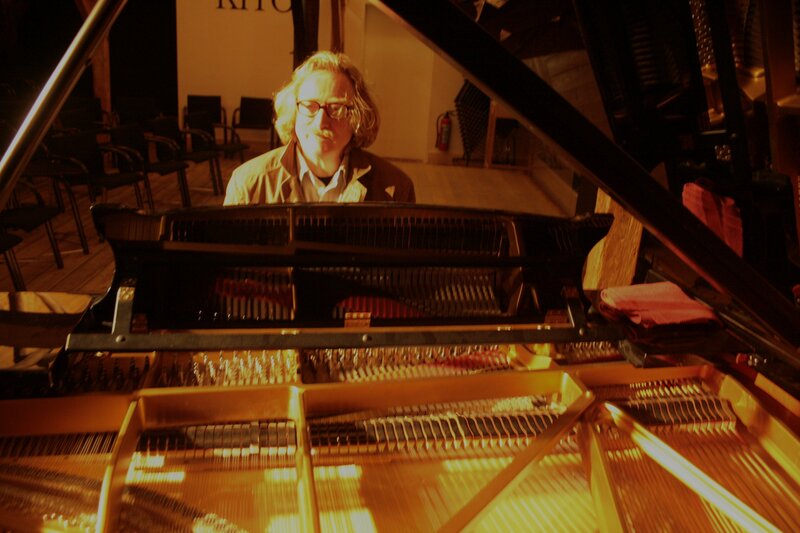 Because of the fact that I’m a pianist, because of the fact that I occupy myself with my instrument, test its physics, I feel connected with the instrument, know my way around with it and can express myself on it. I can’t play the trombone but you can do that on the trombone, too, only there you don’t have harmony. Are there certain times for solo recordings, certain moments in life in which it’s the right form of expression? …excuse me Jasper, but I’ve heard you play solo more than once: It’s not as sweet and dreamy as all that! JASPER: (smiles roguishly) No?! But that’s how you start! Of course there are also moments which are full of energy. The better the instrument, the more introverted you play, because the instrument doesn’t require the energy; you can say a lot more with a few soft sounds.